(January 10, 2018) At over 9,000 feet, Stelvio Pass is the highest and most dramatic paved pass in the Eastern European Alps. While not the most beautiful, it is a stunning road to view, and the wall of 48 hairpin switchback turns running up the north face renders it iconic for car enthusiasts around the world. 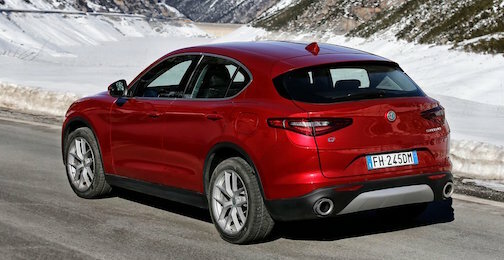 Befitting the name, the all-new Alfa Romeo Stelvio has terrific handling, agility, steering and power to lend both credibility and worthy kudos sufficient to naming it after Italy’s most famous mountain pass. Having successfully built its legacy on sports cars and performance sedans in Grand Prix motor racing, Formula One, sports car racing, and rallies, Alfa Romeo been involved in auto racing for more than a century. At a time when SUV and crossover utility vehicle sales are booming, Alfa launches its first SUV in the history of the company, even though it’s tardy to the party. Stelvio is a five passenger, five-door, all-wheel drive, mid-size luxury crossover built in Cassino, Italy, and is part of Fiat Chrysler Automobiles (FCA). Stelvio is the second major Alfa Romeo model to arrive in the U.S.; the highly acclaimed Giulia sedan began arriving at dealers early last year. Alfa has been absent from the U.S. market for well over 20 years, and FCA is trying to rebuild the brand. In that regard, Stelvio needs to be good if it’s going head-to-head with excellent competition from the likes of Audi, BMW, Mercedes-Benz and others. The old saying is, when you’re the last to arrive at the party you better be the best dressed and best looking. Stelvio doesn’t disappoint, with outstanding looks in a crowd of increasingly lookalike, drive-alike luxury SUVs. 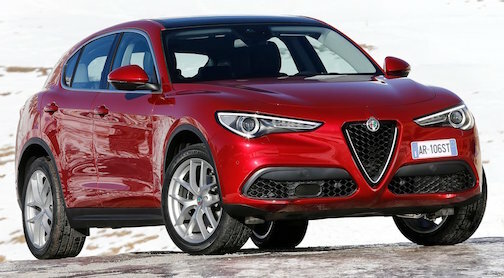 Outside, the Stelvio is replete with shapely curves and bulges and of course the distinctive “Cuore Sportivo” grille (officially called the scudetto, “little shield”), flanked by narrowed LED headlamps all in gorgeous proportions and topped by one of the most historic automotive emblems ever. Since 1910, the Anonima Lombarda Fabbrica Automobili (ALFA) foundation has used the emblem that features a red cross on a white field – the symbol of Milan, the hometown of Alfa Romeo. On the right is a heraldic symbol representing a mythological animal with a human in its mouth. Some see a snake, others a dragon. 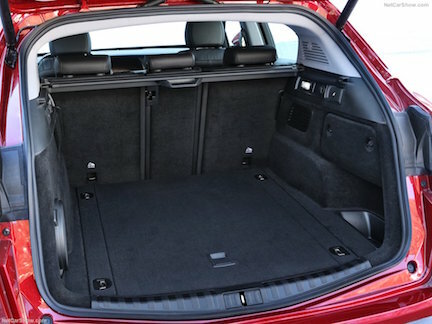 Inside, the exceptional good looks of the exterior don’t transfer to the cabin. The instrument panel is identical to its sibling the Giulia sedan; it’s rather plain with ordinary dark plastic and too-dark wood trim. The materials don’t look or feel as luxurious as competitors in this class. Our test car came with the optional 8.8-inch center display screen (a 6.5-inch is standard). The larger screen is still too small with anything but sharp, crisp, clear graphics for the navigation. The rear backup camera display is even worse utilizing only half the screen and is practically useless, being positioned too far from the driver’s vision. The display screen can’t be operated by touch so everything needs to be controlled via the rotary knob and hard button interface. The overstacked operational menus are convoluted and frustrating to use. Both Apple CarPlay and Android Auto are not yet available and vehicles sold without will not be able to upgrade when it becomes available. Most frustrating, however, was attempting to operate the audio system. For example, when listening to SiriusXM radio, changing the station could only be done via a small, dedicated audio rotary knob next to the large rotary knob on the center console. Push the knob to the right – once for each station. That meant if you are listening to SiriusXM channel 5 and want to switch to a baseball game on channel 175, it takes 170 pushes. Even worse, our system would more often than not default to channel 1 after you turned the vehicle off and then restarted. And finally, we found the electronic shifter fussy to use, requiring the press of the release button to go from reverse to drive yet another and different button to put the vehicle in park. We tested the Stelvio Ti Sport trim level, powered by a 280-horsepower turbocharged 2.0-liter four cylinder engine connected to an eight-speed automatic transmission to power all four wheels. At launch, this is the only engine and transmission available. While it certainly is expected to perform like a sports sedan, the performance heritage quickly becomes apparent. Driving performance is the absolute highlight of the Stelvio and I easily deem it the best driving sport utility vehicle in its class, besting the likes of the BMW X3, Audi Q5, Mercedes-Benz GLC and others. It goes from zero to 60 mph in just 5.4 seconds, handling is precise, smooth, centered and comfortable. It grabs twisty curves on mountain roads like it’s rolling on rails and encourages performance driving. The eight-speed ZF automatic transmission maneuvers with crisp shifts up and down in a nano second through curves and hills. Our only complaint is the turbo-lag and jerky stop-start feature when accelerating after a complete stop. For now, Stelvio is offered in just two trim levels: base $41,995 and Ti $43,995. Sometime mid-2018, Alfa will introduce the Stelvio Quadrifoglio powered by a 505-horsepower 2.9-liter all-aluminum twin-turbocharged V6. Zero to 60 time is expected to be less than four seconds, and top speed 191 mph. How well the Stelvio sells will have little to do with the terrific driving qualities or frustrating infotainment and operating controls. The car-buying public is still massively swayed by their impulsive attention-seeking weakness of driving great looking vehicles. And to that point, Stelvio wins the day. Crash Test Results: Stelvio hasn’t yet been crash tested by the National Highway Traffic Safety Administration or the Insurance Institute for Highway Safety.